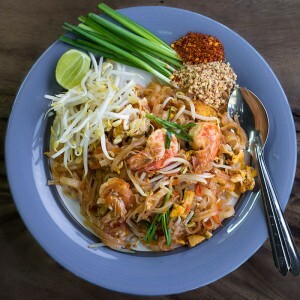 Pad Thai, phat Thai or phad Thai is astir-fried rice noodle dish commonly served as a street food and at casual local eateries in Thailand. It is made with soaked dried rice noodles, which are stir-fried with eggs and chopped firm tofu, and flavored with tamarind pulp, fish sauce (nampla), dried shrimp, garlic or shallots, red chili pepper and palm sugar, and served with lime wedges and often chopped roast peanuts. It may also contain other vegetables like bean sprouts, garlic chives, coriander leaves, pickled radishes or turnips (hua chaipo), and raw banana flowers. It may also contain fresh shrimp, crab, squid, chicken or other proteins. Vegetarian versions may substitute soy sauce for the fish sauce and omit the shrimp.